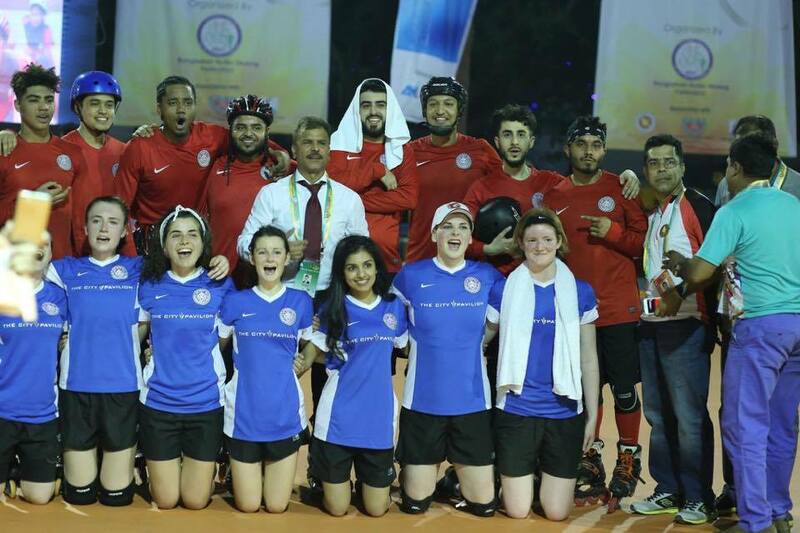 This year, for the first time ever, England was represented by a male and female team at the 4th annual Roll Ball World cup in Dhaka, Bangladesh. 20-year-old Abigail Boxall from Guildford and her England teammates travelled to Bangladesh in February to compete in their first ever Roll Ball competition after being formed less than three months before. Roll Ball is a sport which combines skating, basketball and handball and was invented in Pune, India by Raju Dabhade in 2003. The aim of the 12 players, who are divided into two groups of rolling substitutes, is to throw the ball into the opposition’s goal without entering the goal keeper’s zone. Only six members of each team are allowed in play at any one time and each person has an attacking and a defensive role depending on the state of play. Dhaka hosted the fourth Roll Ball World Cup this year and the England teams battled competitors from all across the globe including Nepal, China and Sri Lanka. The men’s team got through the group stages in the competition and the women’s team came in 5th place! Abigail, who is also an Ice Hockey player got involved with Roll Ball after seeing a post on the Southampton Spitfires Inline and Ice Hockey page. She said: “The sport is new and it is fast and very exciting. You get to meet some amazing people whether they are on your own team, other teams, coaches or even fans of the sport. The England team was only set up in 2015 and have struggled to get funding or sponsorship so they train nearly every day of the week in a West London car park. Brij Haldania set up the team and his son Rohit, 23, a student at Southampton University, is the General Secretary. The economics student is keen to develop the sport ‘organically’ and so each member of the team has a role and they are teaching themselves how to coach, develop a sport and promote Roll Ball. Rohit said: “Our first world cup was funded by friends and family so and this one all the players contributed massively. The England team are working hard to promote the sport in the UK and say the international Roll Ball community is huge. Rohit said: “There are about 50 countries who now get involved and in the last world cup we had 38 male teams and just under that for female teams. “A lot of the other teams have a stronger infrastructure for the sport so across Africa they’ve got loads of teams and they have the Africa Cup of Roll Ball and it’s the same in Asia where they also have a Roll Ball competition. “There are local places to play whereas we have recently got France to sign up because we want to start the European Federation as well. It’s weird because we are the youngest team but we are trying to do the bigger things, we’re really trying to get it out there and encourage people in the process of managing sports. England Roll Ball have entered the Seymours Estate Agents I’ve Got Skills Challenge in a bid to start up some fundraising for the team. The challenge was launched by the Surrey-based estate agents on April 1st, 2017 and aims to uncover local talent and give back the community. The skills can be anything from singing to cheerleading and the person or team behind the video with the most likes and shares online will win £2000 for their chosen charity or organisation. To get involved in the Seymours ‘I’ve Got Skills’ Challenge just visit http://www.seymours-estates.co.uk/articles/latest for more information about creating your video plus the competition terms and conditions.